SoftPlanet makes it possible for everyone to get free Nursery Rhymes Studio download directly from our servers. There is no registration needed for downloading. 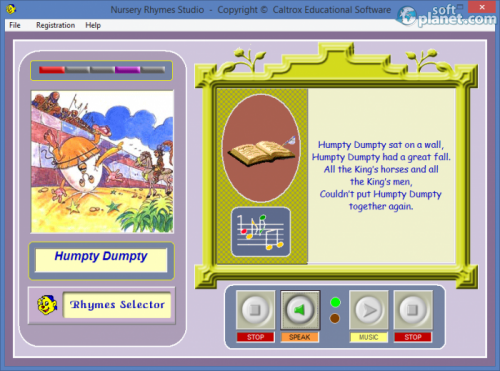 Nursery Rhymes Studio is a multimedia-based software musical method of learning the popular English mother goose nursery rhymes. As you probably may have already suggested, it is designed specifically for kids. This software allows them to learn these rhymes in an interactive way, which is quick and easier for children. Nursery Rhymes Studio version 1.0 is capable of playing voices or music. It depends on you what method you will choose. Unfortunately the voice sounds a bit robotic. All rhymes come with pictures. Thus kids will connect them with particular images and they will remember it easier. This software includes thirty of the most famous nursery rhymes. Nursery Rhymes Studio 1.0 represents one of the most successful methods of teaching children using music, sounds and pictures. In this particular software program, children can learn favorite nursery rhymes. If you have small kids, you definitely have to try it. Nursery Rhymes Studio is VIRUS-FREE! Our security scan shows that Nursery Rhymes Studio is clean from viruses. The current version of Nursery Rhymes Studio has been scanned by our system, which contains 46 different anti-virus algorithms. That ensures that Nursery Rhymes Studio 1.0 is 100% safe for your computer.